The last time we were in Subic, we stayed at Camayan Beach Resort. It was a great place to stay if you want to be close to the beach. To make things different this year, I chose a place which is near the duty free shopping areas, hehehe! 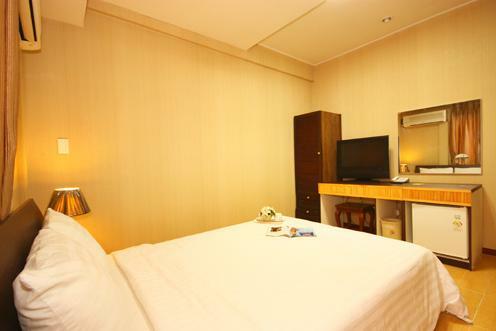 Being right smack in the intersection of Argonaut and Rizal Highway, RK Hotel was in the perfect spot! Royal Duty Free, Puregold Duty Free, and the outlet stores were just a stone's throw away. There's also a Starbucks right across the street. Can you spot our Black Beauty from this distance? We were walk-in guests, actually, and we're just lucky to book a Superior Room for the night. 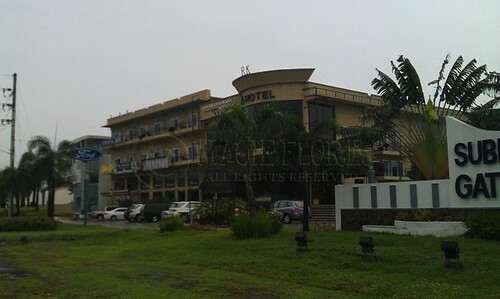 It was priced at Php 3,000 which was ok for a budget hotel and it includes breakfast for two. Rap was free because he's still below 12 years but we had to pay for his breakfast the following day. Although they don't have an enclosed parking area, parking was secure. There was a guard on duty and there are outdoor lighting fixtures all over the place. Photo courtesy of RK Hotel website. I wasn't able to take a photo of our room but it looked exactly like this, at least before the boys messed it up. RK Hotel is owned by a Korean national. As such, all of the appliances were Samsung. Rap said I perfectly fit in because my phones are Samsung, hahaha! The only problem we had was operating the air conditioning unit because the remote control was in Korean. Should I recommend the place? Yes, especially if you want to be close to where the shopping areas and the fast food centers are. If you want to have a private beach front view, you have to try Camayan. However, if you want to enjoy the beach and still get a taste of Subic night life, you'll have to drive a little farther to the hotels found along Waterfront Road.